Astronomers and space enthusiasts will have a rare opportunity to study a visitor from deep space, when it flies by Earth Monday night, January 26. 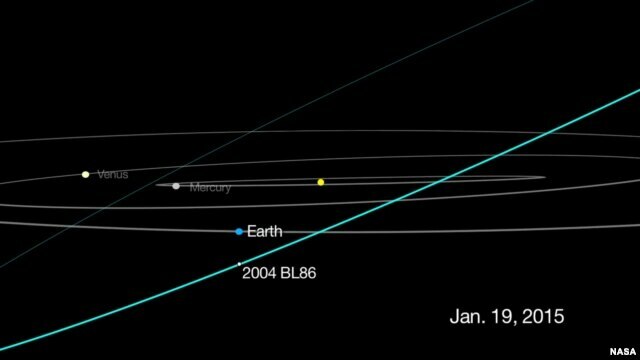 An asteroid named 2004 BL86 will pass close to us... but still at a safe distance of about three times as far as the moon. BL86 is estimated to be about a half a kilometer across, so it will be bright enough to be seen by telescopes used by amateur astronomers and even large binoculars. The best places to watch it from would be North America, Europe, South America and Africa. The asteroid will be observable for several hours moving to the right of the planet Jupiter. BL86 is one of 551 known asteroids with a potential to hit our planet sometimes in the future but astronomers say it will not happen anytime soon. The next visit by a smaller asteroid from that group will happen in 2027.